September 8, 2011 by Ken Ward Jr. Yesterday, the National Mining Association took its shot at imposing the view that the only way out of the nation’s economic mess is more coal and more coal-fired power plants. Of course, the NMA’s views ignore the reality of global warming and — for folks here in Central Appalachia — the very real declines in coal production expected by the end of this decade. — There are already 2.7 million jobs across the clean economy. Clean energy is already proving to be larger job creation engine than the heavily subsidized fossil-fuels sector, putting Americans back to work in a lackluster economy. — Across a range of clean energy projects, including renewable energy, transit, and energy efficiency, for every million dollars spent, 16.7 green jobs are created. That is over three times the 5.3 jobs per million dollars that are created from the same spending on fossil-fuel industries. — The clean energy sector is growing at a rate of 8.3 percent. Solar thermal energy expanded by 18.4 percent annually from 2003 to 2010, along with solar photovoltaic power by 10.7 percent, and biofuels by 8.9 percent over the same period. Meanwhile, the U.S. wind energy industry saw 35 percent average annual growth over the past five years, accounting for 35 percent of new U.S. power capacity in that period, according to the 2010 U.S. Wind Industry Annual Market Report. As a whole, the clean energy sector’s average growth rate of 8.3 percent annually during this period was nearly double the growth rate of the overall economy during that time. — Median wages are 13 percent higher in green energy careers than the economy average. Median salaries for green jobs are $46,343, or about $7,727 more than the median wages across the broader economy. As an added benefit, nearly half of these jobs employ workers with a less than a four-year college degree, which accounts for a full 70 percent of our workforce. Now, you don’t hear many political leaders or business boosters in West Virginia talking about these things. They’re too busy smokestack chasing for a natural gas “cracker” plant, despite the continuing questions about whether the boom-and-bust of that sort of economy is the right way to go. But groups like The Jobs Project, working with companies like Mountain View Solar, can make a difference, as we’ve reported here on Coal Tattoo before. And energy efficiency efforts alone could create 60,000 new jobs in Appalachia over the next five years, according to a report prepared for the Appalachian Regional Commission (subscription required). We’ve also talked many times about the prospects for wind power in places like the Coal River Valley. And what if we really started spending big money from the Abandoned Mine Lands program to clean up the coal industry’s old messes across the region? Think of the jobs that could create. Not for nothing, but one report also projected that carbon capture and storage, or CCS, could create 74,000 U.S. jobs by 2030. But CCS isn’t going to happen as long as industry groups like the National Mining Association oppose efforts in Congress or by EPA to put a price on carbon dioxide emissions from coal-fired power plants. It seems to me that you are inappropriately using green economy jobs and green energy jobs interchangeably in your comparison with fossil energy jobs. You say: “Clean energy is already proving to be larger job creation engine than the heavily subsidized fossil-fuels sector, putting Americans back to work in a lackluster economy.” But you are really talking about 2.7 million green economy jobs, not green energy jobs. Clicking on your helpful link, I looked at the Brookings study on which the blogs are based. Their 2.7 million green jobs are green economy jobs. Green economy jobs are very broadly defined — more than 300,000 in land and forest conservation; more than 350,000 in mass transit, and nearly 400,000 in waste treatment. In other words, Brookings counts bus drivers and sewage treatment plant workers as part of the green economy. However, if you look only at green energy jobs, and if you don’t include nuclear energy (which the Brookings study counts as a green economy job but which many environmentalists would not) as a green energy job, energy production from green renewables accounts for less than 118,000 jobs, nearly half of which are from hydroelectric operations that have been in operation for decades. And that, by the way, is with decades of heavy government subsidies that include, cash and government backed loans to manufacturers of turbines, solar panels etc., cash to users of those products, and a government mandated market share for the electricity produced by these otherwise un-economic sources. Imagine how big the fossil energy economy would be if we count everyone who drives to work in a gasoline powered car or drives a truck or other vehicle that runs on fossil fuel, or the number of workers whose jobs depend on electricity produced from coal and natural gas (nearly 70% of US electricity). In the end, these comparisons fuel a pointless debate. Most forecasts show that renewable energy use will grow (and with it green energy jobs), but that renewable energy will remain a marginal contributor to the total energy supply needed, if for no other reason than the growth in population will create a demand for energy that can only be met by the continued use of all of our fossil fuel resources. There really isn’t a choice. In the end, we will need all the energy we can produce from all the sources we can develop. The portions of this post you’re talking about are direct quotes from the Climate Progress blog — they are their words, not mine — And, as we’ve discussed, there are plenty of forecasts that also say we DO have a choice. I’ve provided you copies of several of those studies, and they’ve been discussed on Coal Tattoo before. Many of the forecasts you mention assume no action by any government body in the U.S. to do anything about climate change — do you believe doing nothing is a prudent policy? Clean energy is already proving to be larger job creation engine than the heavily subsidized fossil-fuels sector, putting Americans back to work in a lackluster economy. Those figures are taken from this report, http://www.peri.umass.edu/fileadmin/pdf/other_publication_types/green_economics/economic_benefits/economic_benefits.PDF … See Table 5, page 29. And Tom, we’ve had lots of previous discussions on the blog about subsidies for coal — you know very well that coal production remains heavily subsidized in a variety of ways. Smokestack chasing? Interesting and very revealing choice of phrasing. Looking very forward to seeing our new WV cracker(s) assume a place among your sustained outrage blogs. You are right that coal and other fossil fuels receive subsidies. My only point was that the same holds true for renewables. The one support ,though, that the renewables receive that coal doesn’t is the guarantee of market share through renewable energy standards. So far as a know, no state mandates that power generators within their borders be required to generate a certain amount of electricity from coal. As to who said what, if you want to quote only selected paragraphs from the Climate Progress blog, then you need to stand behind them. You can’t hide behind the excuse that they weren’t originally your words. You choice the quotes you put in your blog. And, based on your second post, I reiterate the view that you want to compare green economy dollars spend with fossil energy production dollars spent. The comparison is inappropriate. The fossil numbers are just related to production of fossil fuels. The green numbers include anything that someone labels as green…organic farmers, bus drivers, window caulkers, etc. Besides, if you want to include transit projects in your calculation, then you better up the level of subsidies to the green stuff since virtually all the transit projects are funded with tax dollars. As to prudent energy policy, you approach the issue as if climate concerns were the only factors to be considered and the only choice in response is one in which fuel mix in the US must be manipulated by government. I would offer two arguments. First, if you are going to base energy policy only on climate considerations, then the only policies that make any sense with regard to fuel selection will need to be imposed on a global basis. Even if it was practical (and I don’t believe that it is) to stop using coal in the US, it is clear that China, India, Vietnam, Indonesia, to name a few, intend to go on using increasing amounts of coal. Absent global coordination severely limiting the use of fossil fuels, unilateral action by the US is likely to have virtually no impact on climate, but will certainly have major and likely negative impacts on the economy. Second, in addition to avoiding the foolish policy of arbitrarily restricting energy sources from our energy mix that are otherwise available, if you are so sure that climate change requires government intervention, then perhaps we should focus far more policy discussion on the mitigation of expected affects from changing climate, and area where we could benefit from unilateral action. Much like we have done with construction standards for new buildings in earthquake prone areas, we may discover that it is far less expensive to find adaptive solutions to the suggest impacts of climate change. If such policy initiatives result in jobs being created, I will let you count them as green. As always, I enjoy the sparring with you. What, exactly, is your proposal for dealing with global warming — or do you feel it’s something we really don’t need to address? I think Tom answered your question when he stated “if you are so sure that climate change requires government intervention, then perhaps we should focus far more policy discussion on the mitigation of expected affects from changing climate, and area where we could benefit from unilateral action”. I assume that he is saying just to design and plan around it. Anyway, Tom makes excellent points and I’m glad he had the time to reveal the misleading statements made by Joe Romm. Talk about mitigation, at this point, is specious when AEP announces it is abandoning the demonstration plant for carbon sequestration — not because it has either proved or disproved the viability of sequestration — but simply because they’ve made the political judgment that they won’t be compelled to sequester. And isolating energy standards as an unfairly subsidized chunk of market share for green energy, because coal can qualify for it is similarly specious. Green energy doesn’t “qualify” for the subsidy represented by the US military now decades long intervention in the Middle East, motivated primarily to secure our access to oil. If the costs of climate change are too remote to attract your concern, consider the more immediate — in fact, already in hand and repeatedly documented — costs on West Virginia. Our state, which ranks 50th of 51 jurisdictions (edging out only post-Katrina Mississippi), ranks first in the country in one dubious category: Deaths per 100,000 from particulate matter emitted from coal plants. Why include the 2nd thru 5th states? Step back. Look at a map of America. Overlay the footprint of coal plants operated by AEP, the largest purchaser of coal on the North American land mass…..yup, that’s their footprint. And it is no answer to argue, well, that’s the cost of prosperity. West Virginia counties most heavily invested in coal suffer the most economically. Nationally, one in eight Americans, and one in four children, now feed themselves by food stamps. But in West Virginia’s coal fields, that already disgraceful number is appalling. Fully 57% of the children of McDowell County – located in the center of the our coal fields – are dependent on food stamps for daily nutrition. Mingo County, immediately adjacent, feeds 42% of its children by food stamps. In Clay County, home of the largest mountain top removal project of the state, 49% of the children depend on food stamps to eat; as do 51% of neighboring Webster County’s children. Mercer and Wyoming counties are close behind at 40 and 43, respectively. Raleigh County, by comparison, looks better with “only” 38%. Logan and Boone feed 38% and 37% of their children by food stamps. Preposterously, in August 2010, Congress decreased the money distributed nationally to food stamp recipients – already worth no more than $4.50 per day – by $12 billion dollars to fund efforts to avoid laying off 300,000 public employees and to extend state medicare payments for six months. One has to ask how a family of four food stamp recipients, who receive the equivalent of $464 of food per month, will absorb the loss of $59 (13% or nearly 4 of 30 day’s food)? Which day each week would you choose to go without food? In his inaugural address upon assuming the presidency of South Africa, Nelson Mandela admonished his compatriates that history would judge their efforts to displace the legacy of apartheid based upon the lasting effect of their work on their children and grand children. 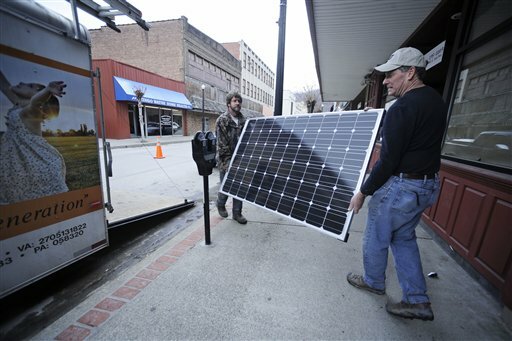 If West Virginia were graded today on the basis of that same standard — the lasting effect on their children — the grade would unquestionably be F.
I sure hope those solar panels being installed in the picture are not from Solyndra Inc., which recently went bankrupt while spending over 500 million in tax payers dollars. I do believe solar and wind have their place in energy production, but again the masses will not put up with power generation that cannot produce on demand. Tom is right, fossil fuel is both plentiful and affordable and won’t be going anywhere anytime soon. A point many refuse to see is a simple one. While the US refuses to look into the near future and build a diverse energy economy other are doing so. As such we see Germany, Spain, Italy, China, Norway, Finland, Brazil, and other countries build out an infrastructure which in the long run means lower cost of energy for them. What do we in the US see? A long-term increase in cost while at the same time allowing the export of our resources to these countries, while they take our jobs and increase our electiric rates all for the betterment of a few large energy companies. And someone said earlier that coal has not been promised a section of the energy pie. I would have to argue the opposing view. Why? The coal industry lobbies and receives so many subsidies they are all but promised a large section of this pie. And as for the future of the fossil fuel industry, one may want to look again at the what others say about this industry. The WV Center for Budget and Pollicy, the WV long term tax forecast, USGS and many other all state the same. The coal reserves of WV are at this time starting a downward trend that may have a few year to year increases along the way but all expect with-in 20 years that we the people of WV will see a major reduction in taxes from coal, coal being produced, and jobs from the industry. So either the coal industry is wrong or everyone else is, which are you going to bet on? Another point for Tom to look at, yes China is building coal fired plants and at an alarming rate. But when one looks beyond this headline he will also see China is building some of the most effecient plants in the world and retiring the older dirty plants. Do a few Google searches and you will see what I am talking about. And what are they doing in the solar field every new house and miltifamily dwelling is required in many locations to have solar water heaters installed. They have now got 10 of the 10 largest solar farms the largest being about 2.2 gigawatts. They are number one in solar PV, thermal, and concentrated production in the world. They are near the top now in wind power and with in the next 2 years it is forcast they will have more solar installed then the rest of the world combined. So when you want to say something about China you may want to examine what China is actually doing. I am no fan of this country, but I do respect what they can do. And if you want to see a change come it may happen in the next few years. The bases of this is most of the Asian countries are now starting to look at feed-in-terrifs which can mean the end of the current coal companies markets. Why? Many of these are based not on todays price but on long term price. A coal plant cost about $3 per watt to build and about another $.005 per watt to operate per year. A wind farm cost about the same to build and about $.002 per watt to operate per year. Long term cost now looks different. Another fact is large scale solar actually requires a larger labor pool then coal fired power do to maintain. So less destruction, lower cost, larger labor pool why would a government not like this? The part you failed to mention is the fact that wind generation currently needs a base load plant to back it up to cover the low availability of the wind generation. You need to have a coal, gas or nuke MW for every MW of wind unless you don’t mind not having power when the wind doesn’t blow. Also, the $50/MW hr is very high for a coal plant. US average would probably be closer to $30. The myth that wind or any other renewable energy needs a baseload has been shattered. Last year the energy consulting firm Ecofys produced a report detailing how we can meet nearly 100% of global energy needs with renewable sources by 2050. That it took until 2010 for someone to produce a cogent report to shatter the myth is the shocker. After all, it really ain’t rocket science. First of all, everyone should understand that the term “baseload power” is simply the minimum amount needed to consistently meet the demands of customers. The more diverse renewable sources come on line across any continent, the less there is of a need for a “baseload source” due to the way power is transferred across the grid. So instead of spreading an unsupportable myth, what we really instead should be discussing is energy and capacity from aggregated sources. The truth is that traditional power plants (coal, gas, and nuclear) are ALL intermittent and need backup power from other sources on the electric transmission grid. For example, from 2003 to 2007, U.S. coal plants were shut down 12.3 percent of the time. During these shutdowns, the utilities go to the transmission line grid and obtain power from other sources. Secondly, unless the fossil fuel advocates who push the myth of “baseload need” either believe that we’ll never run out of coal, or that the Biblical “End of Days” will come before we burn it all, there actually will come a time when even the most hard-headed surface mine operator will be forced to use electricity made from renewable resources every time she fires up her computer. Hopefully it will be before she and her ilk are permitted ruin the entire Appalachian mountain range and poison every drop of our local water right along with our last gasp of fresh air. BTW Ecofys is a Netherlands corporation, where COINCIDENTALLY, on December 17, 1965, the Dutch government announced the complete termination of coal mining. The unemployment rate there is currently at 4.3 percent and the CIA World Factbook rates both their “Happiness Factor” and their average life expectancy far above that of the U.S.
One last thing: In parts of Europe they are already converting water into hydrogen to burn in autos using wind and/ or solar power. Unfortunately it takes CLEAN water to do so. So because of politically supported coal slurry, mountaintop removal, and hydrofracking, it is highly unlikely that this miracle will ever take place in West Virginia. We’re starting to get a lot of broad, sweeping statements and also comments with specific numbers here, so please tell us all where you got your information. I’m not sure which of the many facts I cited above you feel is a “broad sweeping statement” but I am fully prepared to provide links to any that is challenged. But you don’t have to take the word of a group of some egghead coal-hating foreign socialists from the Netherlands for it because our own Stanford Universitys Mark Jacobson and UC Davis’ Mark Delucchi (J&D) also published a study in 2010 in the peer-reviewed journal Energy Policy examining the possibility of meeting all global energy needs with wind, water, and solar (WWS) power. These two AMERICANS revealed that it would be plausible to produce all new energy from WWS in 2030, and replace all pre-existing energy with WWS by 2050! Any other statements I’ve made that anyone thinks are simply views or are otherwise so broad and sweeping that they’re unsupportable can either ask for the links specifically, or simply try wiping the coal dust from their eyes and learn to use google. Sorry to tell you…but right now you need back-up power. You can use a certain amount of wind generation and handle the down time of the generation with the spinning reserve that all power companies have to have available. But, that is why wind and solar won’t go much over 10 to 20% until we develop a way to store the power. The downtime on coal generation includes planned downtime which is always taken during the shoulder months. Coal, gas and nuclear are very dependable during peak months and seldom shut down without giving enough time to plan for replacement generation. So, although we may be able to use more wind and solar in the future, right now, it needs backup power if you go above the available spinning reserve. Calm down. Nobody alleged you wrote anything that wasn’t true. This blog’s comments policy is very clear that readers should include citations and links in their comments, and if you follow this blog regularly, you know that I frequently ask readers on all sides to provide such citations and links if they fail to do so. On this particular comment thread, there are a number of people making both broad statements and conclusions, and citing specific facts or statistics. The purpose of the comments policy is: 1) To make everyone back up what they say with facts, so we can have a reasonable discussion based on science and facts; and 2) So that we can all learn from the experience and information gathered by other readers who research these issues. These are very reasonable requirements and, I believe, set this blog aside from many other Internet sites that simply allow people to say whatever they want — whether there is any basis in fact for what they argue or not. If you don’t like these rules and aren’t willing to comply with them, then this is not the blog for you.